It has come to my attention that a lot of people assume artists purchase their canvases already stretched and prepared from art supply stores. Many do and that’s just fine. But I don’t. One reason is because I often want to work in a non-standard size and the prefab canvases come in a limited range of sizes. Stretcher bars are available in one inch increments so the lengths can be mixed and matched. 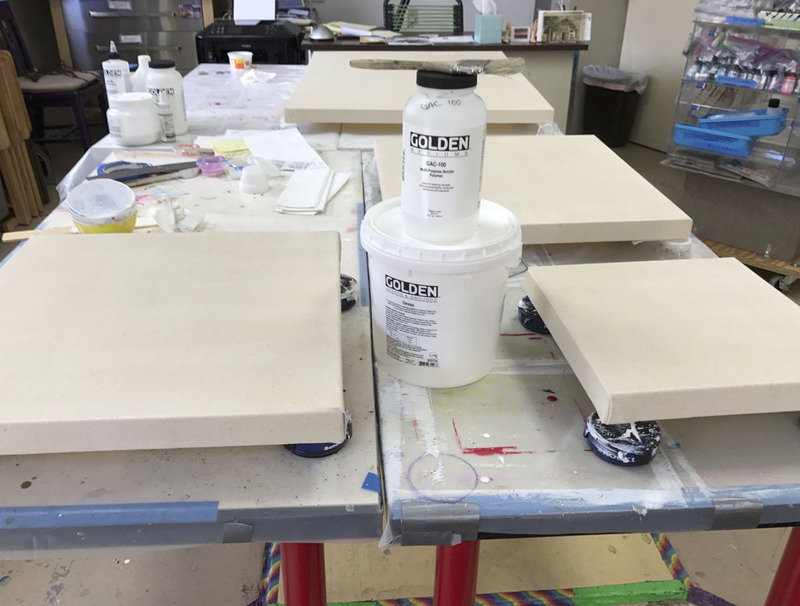 Another reason I prepare my own canvases is because I want to use the highest quality stretcher bars, canvas and gesso possible. When I purchase the parts and then assemble them I know what I’m getting and you, my collectors, will benefit, too. Step 1: Hammer the stretcher bars together and use a t-square to make sure the frames are square. Step 2: Lay the stretcher bars on the canvas. I move them around to figure out an arrangement to avoid wasted canvas. Cut canvas leaving about 3″ extra all the way around. Step 3: Line the frame up on the piece of canvas so all edges are of equal size. Time to start stapling. I use an electric stapler because it’s easier on my hands—note tight blue gloves which help my hands from getting sore). In my right hand are canvas pliers, used to stretch the canvas over the frame. 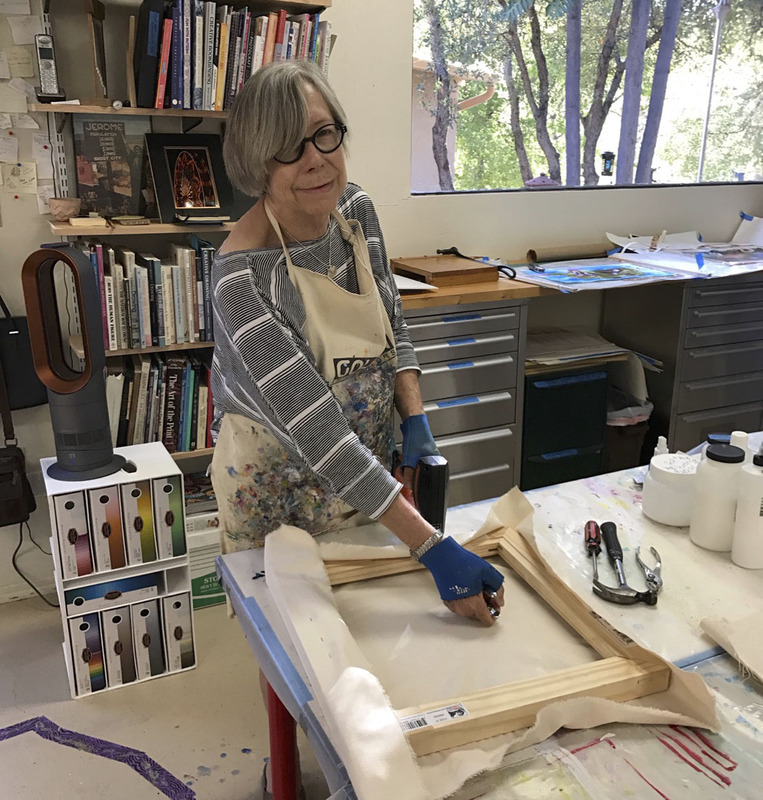 The process is stretch & staple on one side, then do the same on the opposite side, going round and round until the canvas is stretched as tight as a drum over the frame. 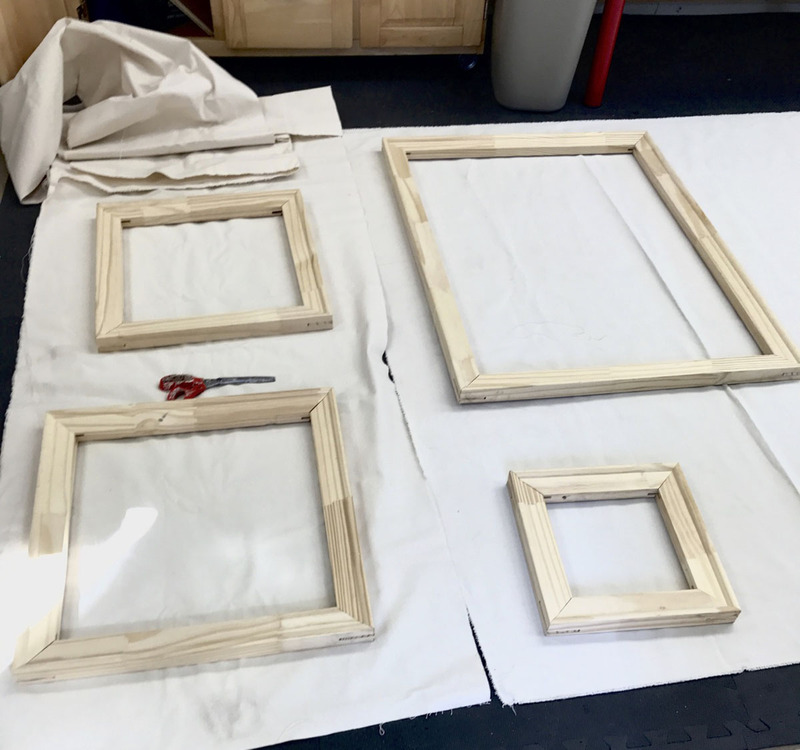 Step 4: Cover each canvas with 2-3 coats of GAC-100, letting dry inbetween. This layer protects the painting from SID (surface induced discoloration) a fancy term for keeping any yucky stuff like pollution from filtering through the back of the painting and discoloring your artwork. Step 5: Apply several coats of gesso. 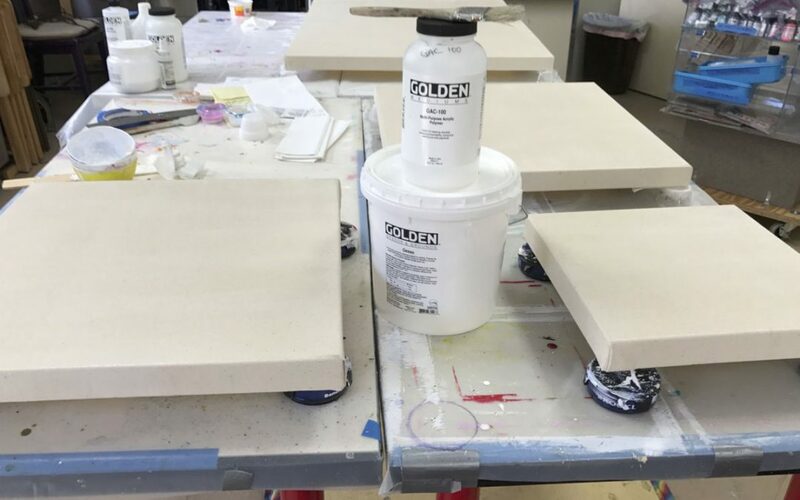 Good quality gesso like Golden improves adhesion of the paint to the surface, keeping the paint from chipping off over time. Plus the bright white is a beautiful surface. Step 6: Let thoroughly dry and then start to paint! The whole process is time consuming but I find it kind of meditative. And you can see I do this assembly line style for efficiency’s sake. So now you have an idea of some of the preparations behind the scenes before I even start to paint!